MESA membership is about active involvement in education and understanding of marine environments. MESA members regularly assist in projects that have national and global implications for better understanding of environments, global warming and other big issues. MESA has never been shy in tackling the big issues as our annual themes for seaweek indicate. In this section we feature a number of projects assisted by MESA. In October MESA members from NSW assisted Professor Malcolm McCulloch and his team from the Australian National University on Lady Musgrave Island and Fitzroy reef. 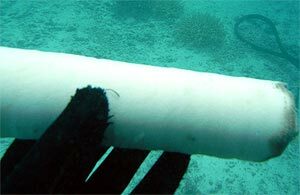 Core samples were taken from large corals. These large corals are often well over 300 years old and the composition of their skeleton contains a record of the past ocean chemistry. From the cores it is possible to accurately determine the ocean temperatures and ocean acidity of the past several hundred years. This information can be plotted and from that predictions made about future trends in ocean acidification and global warming. 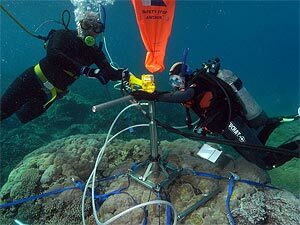 Of particular interest to the researchers was the growth of corals. Increased carbon dioxide levels in the atmosphere and the mixing of air with sea water lead to a decrease in ocean acidity. When the ocean acidifies less and less carbonate is available to form coral skeletons. At a particular saturation point corals will neither add nor lose carbonate. Beyond this saturation point corals will lose carbonate to the acid ocean waters. Predicting this turning point for corals is critical to planning conservation measures and to understanding the effect of climate change on the Great Barrie Reef. Will an artificial reef increase fish stocks? It seems a no-brainer that artificial reefs increase fish stocks, but is this really the case? Do new artificial reefs provide new habitat for fish population expansion or do they simply take fish from other surrounding reefs? A project run by Terrigal Underwater Group (TUG) funded by a Federal Government Envirofund grant hopes to answer this question. In 2009 the Ex-HMAS Adelaide will be sunk on the NSW Central Coast to form an artificial reef. In the lead up to the sinking TUG members under the guidance of Professor Bill Gladstone of Newcastle University are surveying both the sinking site and surrounding reefs to determine species diversity and abundance. The study will continue to monitor local reefs and the artificial reef for some years after the sinking. MESA members have been assisting in this project by performing surveys and collecting raw data for the research team. This project is an on-going commitment for NSW by a local diving club and is aided by support from MESA members. A kayak challenge held in Ballina last on Sun 4th 09 has lead General Manager of Australian Seabird Rescue, Rochelle Ferris, to put out another challenge to the community. “Don’t ever walk past a piece of plastic –that was dad’s (the late Lance Ferris) message over and over again” she said. “Because it all washes into our waterways”. Ballina based Australian Seabird Rescue held the Ballina Island Kayak Challenge as part of a Coastcare initiative, Life on the edge” to encourage people to give back to a volunteer community group that cares for the coast, and to get involved. Ms Ferris said about 40 people paddled in the challenge held over a 10 hour period. The paddlers completed 3 laps of the circuit taking a route along the Richmond River, North creek and the canal. Only doing a few laps per group meant the paddlers succeeded in achieving their other goal, which was to pick up rubbish that had collected along the mangroves lining the water ways. And there was plenty of it. Ms Ferris said the clean up yielded two shopping trolleys, a pram and about 800kg of rubbish. She said she was not surprised about the amount of rubbish collected, but many of the paddlers were. “They were pretty devastated, but all felt good at the end of the day that they were able to make a difference”. Plastics and this level of rubbish is a threat to seabirds,and sea turtles. The Seabird rescue unit currently has 15 turtles in care,a record for the volunteer organization .The latest patient is a male turtle estimated to be over 100 years old and is in a very critical condition. The successful day raised $1,000 for the Seabird rescue unit. The theme is "Hello Nemo goodbye kelp - Exploring our changing coast". It will be held on the 21st & 22nd March, 2009, Eden Marine High School. The NSW MESA Branch, as part of Seaweek 2009, is running a poster challenge for Students from K to Year 6 in New South Wales.